As we walked into the Kō Hana Rum tasting room — once the general store and post office for agricultural workers in the tiny town of Kunia — a young woman pushed a fibrous sugar cane stalk into an old press and handed us the results — a glass of pure single varietal heirloom sugarcane juice. It tasted slightly grassy, like the very pale and tender end of a stalk of grass, but sweet. I’d never thought of sugarcane in the sense of varietals, like you do wine grapes. But the sugar cane varietals that we saw outside in their demonstration garden a few minutes later showed us a few of the hundreds of types of cane that were once commonly found throughout Polynesia. One plant’s stalks were striped schoolbus yellow and black, another glowed seaglass green, and some sugarcane grew perfectly straight while others arched gracefully until their tips touched the ground. 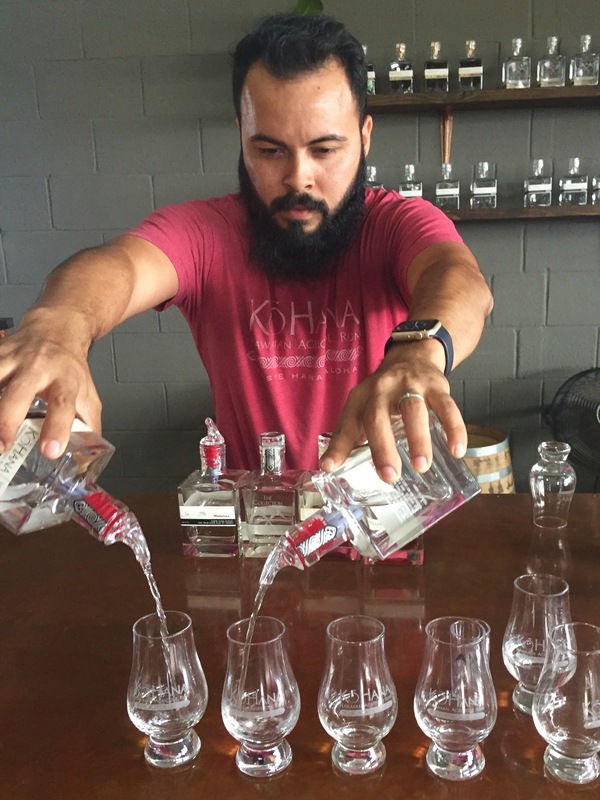 Each small batch of Kō Hana rum is made from a single variety of long forgotten heirloom sugarcane that the distillery owners have been reviving with help from experts at Honolulu’s Bishop Museum and DNA testing. These plants were brought to Hawaii by canoe from other parts of Polynesia centuries ago, but most fell out of favor as big sugar growers like C and H preferred certain types for maximum sugar output. While most rums are made using molasses, the byproduct of sugar production, Kō Hana rum is distilled from fresh-pressed cane juice, and is known as agricole rum — a pure expression of each plant. Back inside the tasting room we were handed tiny glasses so we could compare. The aroma of each rum was heavenly, like freshly cut lawn at first dawn on a summer day. Each single-origin rum had a complex flavor that really took off and deepened when the barrel-aged rum was poured. We were curious to find out how it tasted in a cocktail, so we made a note to look for it around Waikiki. That night at Mahina and Sun’s Restaurant in our hotel – the retro-hip Surf Jack — we spotted an “Unkle’s Punch” on the menu that mixed Kō Hana rum with a heady swirl of Campari, falernum, lime juice, and orange bitters. The drink was crisp and lively and would likely have been delicious no matter what the rum, but it seemed especially complex and fresh thanks to the Kō Hana spirits. We were inspired to try more, and started on a treasure hunt throughout the island looking for other restaurants and bars serving Kō Hana rum. I must say that Mai Tais have never tasted so good – Kō Hana completely transformed this often overly sweet island classic into a sophisticated better self. Looks like Hawaii is giving this Caribbean-focused spirit a rum for its money.